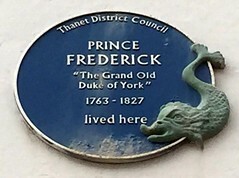 The Prince Frederick, Duke of York and Albany KG GMB GCH (Frederick Augustus; 16 August 1763 – 5 January 1827), a member of the House of Hanover, was the second son and child of King George III, King of Great Britain and Ireland and Elector of Hanover. A soldier by profession, from 1764 to 1803 he was Prince-Bishop of Osnabrück, and from the death of his father in 1820 until his own death in 1827 he was the heir presumptive to his elder brother, King George IV, both to the United Kingdom of Great Britain and Ireland and the Kingdom of Hanover. However, he died before his brother. Frederick was thrust into the British Army at a very early age and was appointed to high command at the age of thirty, when he was given command of a notoriously ineffectual campaign during the War of the First Coalition, a continental war following the French Revolution. Later, as Commander-in-Chief during the Napoleonic Wars, he oversaw the reorganisation of the British Army, putting in place vital structural, administrative and recruiting reforms for which he is credited with having done "more for the army than any one man has done for it in the whole of its history." 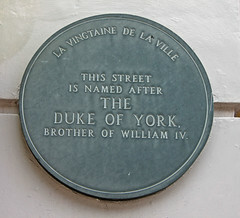 This street is named after The Duke Of York, brother of William IV.